The small town of Fiesole is a very popular tourist destination in Florence. The town is less than 10 km away, high above the city of Florence. 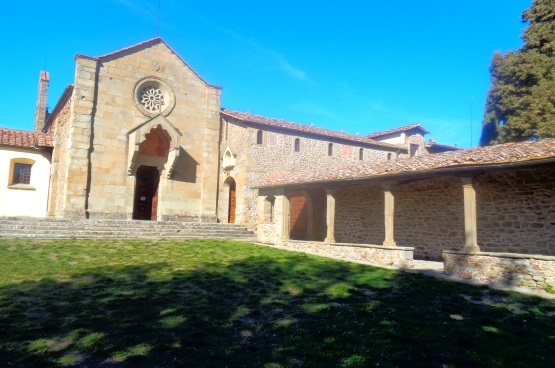 Fiesole has a large Roman excavation, a monastery, a beautiful church and a great view of Florence and Tuscany. You can easily reach Fiesole with a city bus for 1,50 Euro in less than half an hour from the centre of Florence. In Fiesole there are also some nice restaurants and cafes. During the time of Emperor August in the 1st century B.C. much was built in Fiesole. This includes a beautiful open-air theatre (amphitheatre), which can still be seen today. The Florence city bus line 7 stops in Fiesole on the central square „Piazza Mino da Fiesole“. All the sights listed below are less than 300 metres from this square. In Florence the bus departs from the small street „Via di Giorgio la Pira“ (also often simply called Via la Pira) near the famous art museum Galleria Accademia. Two tickets per person (round trip) should be bought in advance, for example at a tobacco shop in Florence. A ticket costs only about 1,50 Euro, so the excursion costs 3 Euro per person. During the week there are about 4 buses per hour from Florence to Fiesole and back. Also later in the evening there are buses, so you can have dinner in Fiesole and then take the bus back. 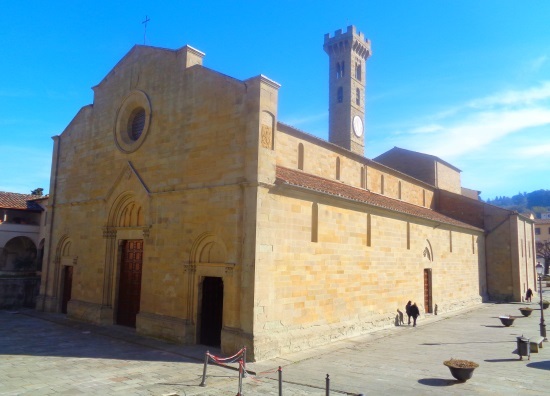 Cathedral San Romolo: The Duomo di Fiesole stands almost directly on the central square Piazza Mino da Fiesole, where also the buses of Florence stop. You can see the church from inside and outside. We didn’t have to pay any entrance fee, the door was open and we could just go in. 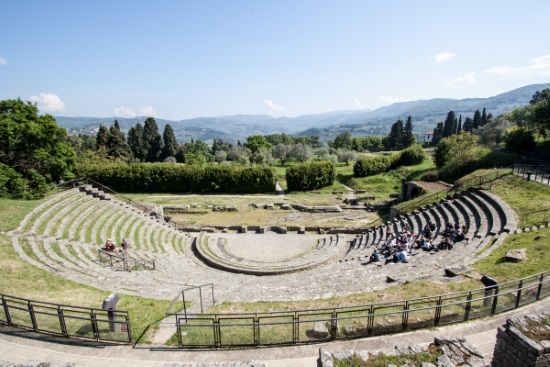 Amphitheater Fiesole: Almost directly behind the cathedral there is a bigger excavation that can be visited as a visitor of Fiesole. The highlight is an old Roman theatre (Open Air) that is well preserved. There is also an archaeological museum and an art museum called Bandini Museum. Fiesole Monastery: If you go from the central square with the bus stop Piazza Mino da Fiesole a way further up, you first come to the place with the great view of Florence (see below). A few more meters is a monastery. One can visit the nunnery, some rooms and the church were simply open during our visit, we did not have to pay entrance fee. Neither the monastery nor the church cost admission. You only have to pay for the excavation with amphitheatre and the two museums (Archaeological Museum and Art Museum Bandini). There is a total ticket for all 3 sights for 12 euros. Children and students pay 8 Euro, children under 7 years do not pay admission. If you only want to visit the excavations with the amphitheatre you pay 7 Euro (reduced 5 Euro). There is also a small combined ticket excavation and archaeology museum for 10 euros (6 euros). Be careful, the Bandini Museum is open all year round only on Friday, Saturday and Sunday. The excavation with the theatre and the archaeological museum are open every day except Tuesday. In summer the opening hours are 10 am to 7 pm, in winter 10 am to 3 pm. In the months between summer and winter, March and October, is open from 10 am to 6 pm. 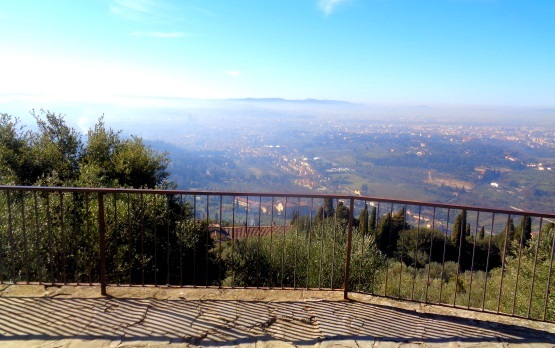 Many tourists come to Fiesole because of the magnificent view. 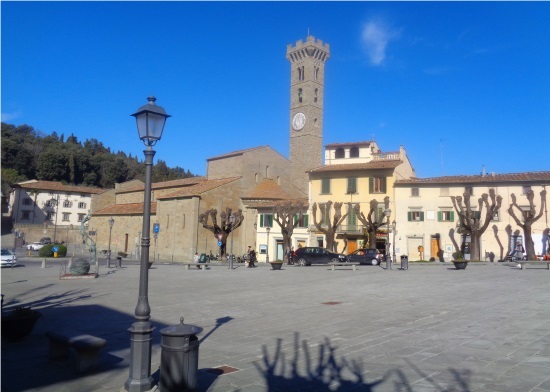 From the square, take the bus to Piazza Mino da Fiesole and walk up to the monastery. After a good 100 meters steeply upwards you are already at the place with the best view (see picture). You see directly on Florence. The cathedral with the mighty dome of Florence is easy to see. Those who are familiar with Florence will also recognize some other buildings. Unfortunately it was a little hazy during our visit, so you can’t see Florence on the photo. You can also see the surroundings of Florence, beautiful landscapes and villages of Tuscany. On the right you can see the airport of Florence and watch the planes take off and landing. We do not know any other place in Tuscany with a better view than Fiesole. Fiesole has by the way 14.000 inhabitants, but the city looks smaller, more like a village. There are many villas in the area. Many rich inhabitants of Florence have bought or built a house with a view up here. Another great day trip destination of Florence is the city of Prato.